Personality: Myyra is calm, cool and collected. She doesn't speak much, but when she does, you better listen. She communicates mainly through body language and it is nearly impossible to tell whether or not she is listening. She never looks at the speaker, though she is always listening. She cares deeply for her pack, and will do anything in her power to save them when they are injured-and that's a lot. She is a highly respected member of the pack, though she never flaunts it. She is incredibly knowledgeable about the past and magic in all forms. She tends to hang around the more magical creatures, and they have a strange way of finding her. A common one is a white buck with white flowers adorning his antlers that never seems to shed. The pack has been forbidden to hunt this particular animal. 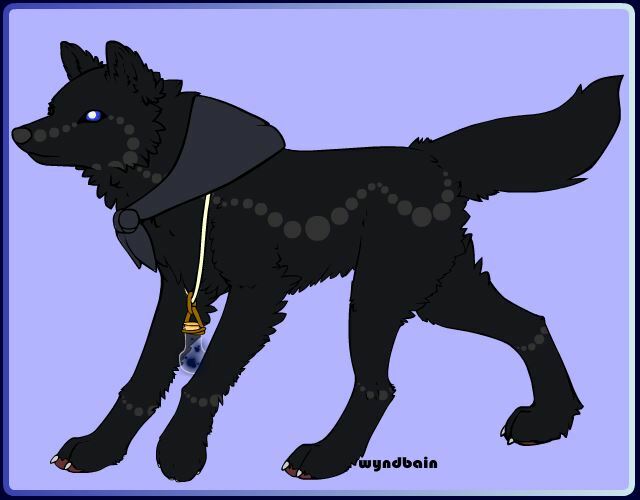 Objects/clothing: She wears a black bandanna as well as a rope with a glass vial she found some time ago with small blue glowing lights in it. Appearance: Myyra is small by most wolf standards, not built to fight at all. She has dark grey spots that run from her nose to the back of her thigh that also ring around her wrists and ankles. She is darkly colored in respects, and her appearance is overall mystical. But that's before you notice her eyes. Her eyes are deep blue in color, but her pupils are pure white, as she is completely blind. Family: All dead. Both were warriors, killed in battle. Her siblings were born sickly. She was lucky to survive, and even then, she was born blind. Strengths: Due to her blindness, all of her senses are hypersensitive. It is nearly impossible to sneak up on her due to her heightened hearing and smell, and she is hypersensitive to movement around her, having a strange ability to sense the presence of others around her. Weaknesses: She is completely blind, and not super strong, as well as very small. Special Powers: She has a very strange ability that does not suite MoonPack at all. She can create orbs of light at will, such as the ones in the vial around her neck. They can be of any size, and they move around of their own free will, but remain in the same general area. These light her den, though she cannot use them. She also has weak healing powers, and an incredible connection to her ancestors. Combat Style: She doesn't fight, but she prefers tact and strategy. History: Myyra was born among a litter of four sickly pups. The other three died within the moon, and she was blind. She grew up in complete darkness, and gradually grew to be able to control her powers, as she couldn't see her successes, it was very difficult. She grew up and became a Shaman, though she moved quickly through the ranks, and was appointed Lead Shaman when the previous one died of old age. Her parents were grievously wounded in a battle with HydroPack, and died at her paws when she failed to be able to save them. Since then, she has grown much more turned inward, and her fear f failure grew stronger. RP Sample: This is Shine.